Sanctuary Cove is an absolutely unique family holiday experience set on a half acre cliff top location. 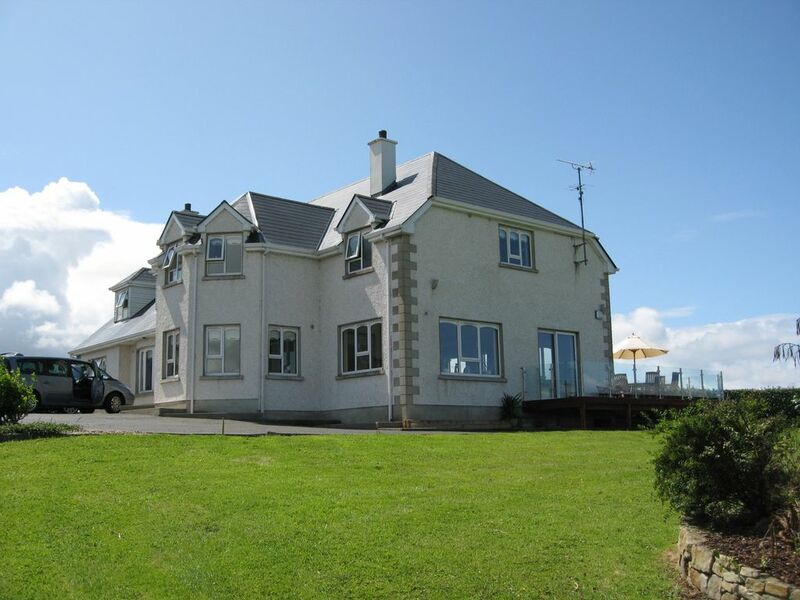 It offers spacious and luxurious accommodation and enjoys uninterrupted sea views of Donegal Bay, Killybegs, St John's Point, Slieve League and the Dartry Mountains. The property has been completely renovated by its presents owners and transformed into a modern retreat. It has a bespoke 'Greenhill Kitchen' with open plan living and dining area, newly installed SKY Q tv to multiple rooms, separate sitting room with open fire, 6 large en suite bedrooms, games room with pool table and PS4, a selection of books and toys; 50 sqm decking, internet access, outdoor children's play area with ample private parking and recreation area. It is perfect for family reunions. It is situated in a beautiful, private setting (yet not secluded) and within walking distance of all amenities that the town of Bundoran has to offer. It is ideal for touring the North West of Ireland and of course the Wild Atlantic Way. All bathrooms are fitted with showers - there is no bath. A baby bath can be provided on request. Kitchen has everything that an experienced chef requires! Twin ovens, 5 ring gas hob, American style fridge/freezer, dishwasher, microwave, centre island, Quartz worktops and constant boiling water tap. The house is very lovely, very comfortable. Very well equipped kitchen. Lots of space for a large group to spread out. Lovely deck facing the ocean. Pat the Manager of the property was very accommodating and came to allow us into the house earlier then originally arranged. Also communicated with owner which was great. We have stayed in Sanctuary Cove before and that is the reason we returned! This is a fantastic property for a family get-together. Very well equipped with excellent attention given to detail. Games room is ideal for children of all ages. Catering facilities would please any chef! A wonderful advantage is that each bedroom is en suite. I cannot recommend the property enough - certainly 5*plus. Great communication from the owners - they have given great thought to what is required to make a holiday enjoyable. We will return! Brown family Belfast and Oxshott. A big thank you to Colleen & Adrian and not forgetting Pat who was ‘on call’ should we have any problems. There were none! Our family is so happy to have stayed at beautiful Sanctuary Cove for a family reunion week for the second time - first, in July of 2016, and this time in July of 2018. The house is perfectly situated for a get-together of extended family. Our group included couples, singles, children, and an elderly aunt, 10 in all. Amazingly, that left us with an extra bedroom for occasional guests from the extended family who came to visit all of us during the week. We had two large family parties while we were there, enjoying the spacious deck, backyard play area, and large garden area on which we played baseball, Gaelic football, and all kinds of games for kids and adults alike. I have kitchen envy, not just because of the amazing layout (love the pot drawers, dish drawers, and utility drawers) and functionality, not just because it is stocked with everything you could need for an intimate family stay or a large family get-together, but most of all because of the amazing views out the windows as you are cooking, making tea, and enjoying chat with loved ones. There are four ample seating and gathering areas: a large great rooms, two separate TV/seating rooms, and the TV/games/pool room on the top floor. During our large family parties, the teenagers and young adults gravitated to the deck and the games room, while groups of adults could cluster in various locations. It was perfect for us as some wanted to watch the World Cup while others wanted to quietly chat indoors, some wanted to play pool or video games upstairs, and many wanted to enjoy the fresh air and spectacular views from the deck. On our quieter days, the multiple living areas were perfect so that we could spread out for our own relaxation, reading, talking, etc. without feeling like we were on top of each other. The bedroom layouts are suitable for a variety of different family combinations - couples, singles, parents with children, children alone, etc. plus a laundry room with ample space for folding & hanging clothes. So many details exceeded expectations: beach toys and a kite, books and games, and a beautiful welcome basket with wine, fresh crusty bread, and Irish butter. But the best thing about this house is its proximity to the cliff walk and the spectacular views. Walking on the path at sunset, watching the sunrise, and enjoying the view on deck was a joy. Kudos to owners and their local property manager for being so easy to work with and responsive. Hope to be back in 2020! We had a wonderful time staying in this house. 13 adults, all family, attending a wedding. The house is comfortable and well equipped. Lots of space both inside and out. The weather was perfect and the big decking area was fantastic for our barbecue. It is well situated for visiting scenic high lights in the area. A simply amazing property in the perfect location. We had such a wonderful stay in this house, it has everything you need for either a family or multi party/family stay. The presentation, facilities, location and views are simply perfect and you could not ask for anything more to make a perfect holiday. We thank the owners for such a great time. The views are beautiful and the kitchen is stunning. I would thoroughly recommend this house and have already done so! Bundoran offers a large variety of shops, restaurants, pubs, supermarkets, banks. Leisure activities available locally include surfing, kayaking, sailing, sea angling, course fishing, Waterworld, golf, mountain biking, cliff top walks, 10 pin bowling, 6 screen cinema, local beaches, children's adventure centre, funfair, variety of family entertainment. Please note some of these activities are seasonal.